The community delivered! Or, particularly, [Ag Primatic]. With a clever approach to the problem, some assembly language programming, and an optional Arduino crystalectomy, [AP]’s solution is rock-solid and glitch-free, and you could build one right now if you wanted to. We expect a proliferation of cheesy synth sounds will result. This is some tight code. Hat tip! The artwork is great, as it usually is. But… can anyone explain to me what is going on there? Did Howard the Duck play an electric organ? Is there some cultural reference there that I am ignorant about? Help me, I am curious! Pretty sure that’s a Donald the Duck costume, I’m none the wiser on any references though. That’s Elton John, playing a Hammond B3 organ. No top octave dividers or cheesiness in THAT organ! The illustration is great, as usual. But.. What is going on there? Was Howard the Duck into playing electric organs? Is this some other cultural reference that I am ignorant of, maybe a perfomer who dresses/dressed up as a duck? Why not use a Teensy 3.2? 120 mhz clock. Some (many) faster CPUs have an instruction cache (and cache misses can ruin your day), and/or interrupt latency can be problematically huge. Starting with a 20MHz CPU where every instruction takes guaranteed fixed time is sometimes an easier solution. Anyways, my Polytron DCO runs 37 oscillators fully polyphonic. I seem to recall that 2MHz was slightly under the desired frequency. Don Lancaster certainly covered this in one of his articles about electronic music in the seventies, probably in both his TTL and CMOS Cookbooks. I did build programmable divider to play with thIs, using an ft-243 crystal. But then top octave generators arrived, and no need to build the equivalent. Worst case error was +/- 1 cent. If you have a better base clock frequency, I’d love to try it. The highest µC clock the lowest the error. The cheap blue pill can run at 72Mhz the error should be reduced by a factor of ~6. You have a great memory, Michael! I searched through the back issues of Popular Electronics, and found the articles by Don Lancaster from 1974(!) that you may have been referring to. If you divide the 1.94204 MHz clock by 2, the ratios fit into 8 bits. The downside is that the pitch accuracy is +2.5/-2.8 cents, not as good as the 2 MHz version accuracy of +1/-1.4 cents, but probably still acceptable. Also, I’m not sure where to source the 1.94204 MHz crystal (or its multiples) from. It doesn’t seem to be a standard value. P.S. Don has an error in one of his 8-bit divider values. The value for F7 should be 174, not 176. Using 176, the pitch error would be -22 cents! Maybe I’ll send a correction to Popular Electronics…. Exceptional Hack! I tried for a while to do this without an ISR using a similar jump table between nearly-identical portions of code. However, this is a MUCH cleaner solution that doesn’t take a bunch of hard-coded unrolled loops. Eventually I ran out of time and wrote this off. However, it’s incredibly refreshing to see that someone else had a better approach that I could learn from. Kudos! One minor optimization that you can do (if you’re so inclined) is that you can use 2 of the 8-bit hardware PWMs in the processor to generate 2 of the odd divider clocks (/239 and /253 are ideal since they fit in a single byte). From the summary in the article this means that you’re down to creating the 10 remaining pins via your software methods. That means you can get the same perfectly stable results with the stock 16MHz oscillator and no hardware changes to get all 12 signals (2 via PWM and 10 via software). Great Job! I’m also glad I wasn’t the only one to lose some sleep over this as well! I also tried initially to do this without an ISR. It was a painful exercise in clock cycle counting and trying to balance all paths through the code to be equal. The ISR made it so much cleaner, and it only costs a few extra clock cycles to enter and exit. I may be inclined to take you up on your optimization so we can all use a stock 16 MHz Arduino. Great idea! So I coded up your optimization of running 2 of the outputs directly from the unused timers and the other 10 via software, and it worked! With a 16 MHz clock, I can get all 12 outputs now. Thanks for your suggestion, EMControl! On a Propeller, generating 12 symmetrical clocks would be a matter of starting 6 cogs and letting each cog starting both of its Numerically Controlled Oscillators with different parameters. Once the clocks are running, it won’t even need to execute any code anymore. Just saying. Solder a couple of propellers in your 70-ties keyboard. I think a $0.50 ATTINY816 with a 20 MHz crystal is the lowest cost solution for a top octave generator. All the other suggestions seem to be much higher in cost. Plus, the ATTINY816 is available in a 20-pin SOIC package (tiny, but still hand-solderable), and it’s 5V compatible. Slightly disingenuous. You’re comparing the price of discrete components (without the PCB that will be needed) with that of development boards. How much does a low-end ARM chip (from Microchip, Atmel, or STM, for example) cost? I can understand if you don’t want to bother with the research, but then don’t quote apples-and-oranges prices. Propeller is a $4.47 IC in 10K quantities, not a board. So that’s an apples to apples comparison. Teensy 3.2 uses a MK20DX256VLH7 processor that’s $4.85 in 10K quantities. Teensy 3.6 uses a MK66FX1M0 processor that is $10.59 in 10K quantities. You are welcome to provide data on your suggestions. Your target is $0.50. I didn’t say that there was a cheaper solution, and I doubt that there is. I was only contesting your 40:1 to 60:1 ratio between an ATtiny16 and an ARM. 5V, 20 pin, 10 HW PWMs, 32MHz internal oscillator (no need for xtal if you don’t mind some drift). bit over your target $0.50, it’s at $0.63@5K. 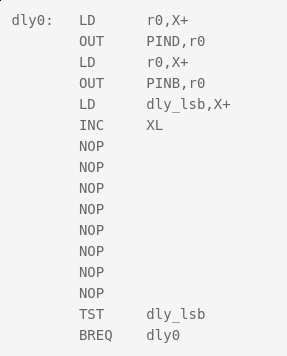 if you don’t need the whole 20 pins, they have $0.50@5K 14 pin controllers. Here’s what I see as a problem with the PIC16 architecture in this application. Even though the PIC clock can run up to 32 MHz, the minimum instruction cycle time is 125ns. This is equivalent to an 8 MHz AVR processor. I doubt that this algorithm will function with only 8 instructions in the inner loop, even before trying to code it in PIC assembly. That PIC would be perfect. After initialization, zero code overhead. Ag Primatic – Those peripherals can be setup to take an external input pin and divide it down by a user selectable scaler with a user selectable offset. So it doesn’t matter if your main system clock is operating at 32kHz. I would love a hackaday highlight or competition where projects use microcontroller peripherals instead of throwing clock cycles at problems. 10 HW PWMs is very close to 12, but I’m sure that some people would miss the remaining two notes per octave… Are you suggesting implementing the other two in firmware? Have done it it? Price isn’t super-critical here, but Ag’s solution is definitely cheap and cheerful. From which set of peripherals would you get the 12 divided-down frequency outputs with zero code overhead? Equal Tempered is not is in tune with it self. Other temperaments should be easier to compute in fewer steps. The irrational number difference of ET tuning is a mess. If you are going this far you should have several temperaments available just like most modern keyboards and organs. Then there is Arabic tuning etc. If this temperament thing is puzzling look it up and hear the difference. Scala.org has something like 3000 tuning scales of the whole musical world. This is an issue with all synthesizers that derive their pitches from a single oscillator. The bottom line is, the higher the frequency you’re deriving the pitches from, the closer to the irrational ideal you can get. Congratulations. I remember turning this over in my head a bunch and could not figure out a good solution… really neat work finding the “gaps” where there was enough time to compute more entries for the buffer. I came across this when looking for Arduino information. I bought some pro minis (16MHz ATmega328P) for a project, want to program in assembler, looking through random articles. This seemed like a really good challenge, I have figured on paper a solution that I think will output all 12 notes with more accurate frequencies than the solution here. The only compromise I have made is that where transitions are closer than 2 microseconds they occur at the same time. Is it worth my time to continue – does anyone care? I am a bit of an assembler junkie, last efforts writing stuff for PIC16F628A a few years back. But new to Arduino so a minimal hardware project would be good learning before tackling my own project which is a bit more hardware dependent. If you’re willing to summarize your algorithm, I’d be happy to see whether it would work for his application. It would be okay if the duty cycles varied, but the periods of eiach note need to be unchanging for the tones to not warble. I have written the program in Atmel Studio 7 and run it in the simulator and it appears to work. Technique – a ring buffer 256 bytes with 4 byte cells: 2 byte timer, 2 byte port bits. Timer 1 is set to run from 0 to ICR1 and reset (ICR1 = 0x7FFF). For each cell a timer value is put into OCR1A, when Timer 1 hits that value the interrupt routine outputs the port bits then moves to the next cell and sets up a new value in OCR1A. That takes 18 clock cycles and there is some overhead in servicing interrupts so I allow 32 cycles (that’s where the 2 microseconds comes in). If a bit needs fiddling up to 32 cycles after the time in the cell, the bit is added to the port bits rather than getting a new cell. The mainline has to load up the ring, it keeps the next times to flip bits in registers 0-23 (12 pairs=12 notes). When a cell becomes empty the 12 pairs are scanned to find the lowest value (takes about 80 cycles) and this is the selected time for the next cell. The subsequent flip time is then calculated for that note by adding the appropriate cycles (e.g. C8 4186.009 Hz has a flip period of 1911.128 cycles at 16MHz. For each note a 1 byte frac value is held in memory and concatenated with the register pair when updating so the note value is good to about 2 parts in a million. As far as I can work out, the mainline spends about 140 cycles setting up each cell and the interrupt that services it takes maybe 30 = 170 cycles. There are on average over 200 cycles available so should be fine. Is there a way to post the assembler source? OK I loaded the program into a Pro Mini board (which is what I bought) using avrdude and it is definitely outputting some notes on some pins. I don’t have the equipment to say if they are the right notes and all presented on connections on the edge of the board (still climbing that learning curve). If someone wants to see if it is any good, just let me know where to send the source code. Version 2 now seems to be working. Frequency of notes as before – accurate to 2ppm. Jitter now +-5 cycles or about +-350nS. Anybody got equipment to test it properly? OK, here’s a quick back-of-the-envelope analysis. Let’s take A7 as an example. The nominal frequency of A7 is 7040 Hz. This note would have a nominal period of 142.045 us. You are stating that you have +/- 350 ns of jitter, so that would make the period vary between 141.695 us and 142.395 us, or the frequency will vary between 7023 Hz and 7057 Hz. In cents (1/1200 of an octave), this would be a deviation of +/-4.17 cents. According to Wikipedia (https://en.wikipedia.org/wiki/Cent_(music)#Sound_files), the Just Noticeable Difference (JND) for pitch is 5 to 6 cents, so a variation of more than 8 cents will be noticeable. In addition, there will be a time-varying beating between two simultaneously played notes that will also be audible. My solution has the same accuracy as the original Top Octave Tone Generator (which is -1.4/+1 cents) and the tones have 0 cycle jitter, so the frequencies are as stable as the crystal oscillator (and no time-varying beating of two simultaneous notes). I was also able to get all 12 notes generated from a standard 16 MHz Arduino by taking EMControl’s suggestion of having two of the notes generated by hardware timers, and the other 10 by the software algorithm. I see a fundamental flaw in my thinking. I have produced a ‘top but one’ octave generator – . Which is a pity because it’s a good one. I assumed (bad thing to do) that we were talking about a piano, which has a top note of C^7. I’ll just have to double the clock frequency (or use two chips – now there’s a thought). The notes I produce are pitch perfect (give or take 2 parts per million). The A7 generated by a 2MHz clock is off by 28 ppm. The actual note periods are irrational so a digital source can only approximate the correct transition time, ideally to the nearest clock cycle. A 2MHz clock would be up to -+250nS out even ideally. I used the 16MHz clock and as long as producing a single note it will be as good as the variation in latency of the interrupt routine (0,+1 cycle – I don’t use any three cycle instructions in the mainline). The problem comes when transitions are required for two or more notes close together. In that case some transitions are moved +- up to 4 cycles. Which is what I called jitter. Since it occurs about 1 transition in 5 it would be inaudible. Back to the drawing board. I thought it was too easy. Most likely, you already have the best test equipment for this – the mark I biological auditory sensor. It’s nice for the frequencies to be right, especially if you’re going to play with other instruments, but the only adequate test of whether +/- 5 cycles is good enough is by listening to it. Furthermore, the percentage error (or parts per million) doesn’t mean a thing – what’s important is how many Hertz the pitches are off, particularly each note compared with the others. There’s nothing more annoying than playing a chord and hearing a 5-10 Hz “flutter”. This flutter is caused by intermodulation between different notes within the ear, and it’s something you really need to test using ears rather than electronic instruments. This is also where jitter can become an issue. Again, it doesn’t matter how many clock cycles the edge is off; it matters what pattern this jitter makes, which can only be determined by playing chords. Excessive jitter may manifest as a “mechanical” sound that’s unrelated to the notes being played, or a kind of harshness. As you see from my other comments, I stuffed up. The cycles I mention are clock cycles at 16MHz. I am pretty sure even the best of ears would not pick up one edge in 5 shifted less than a microsecond. As for my ears, I don’t think they notice much over 3kHz so I’d need to find a younger person. But you see, it’s not as simple as that. I assure you, if one edge in 5 is shifted “less than a microsecond”, there is a very good chance that it will be audible. If there’s a glitch that happens once a second, every second, where an edge is off by one clock, this CAN be detected by an UN-trained human ear. I learned this 20 years ago, when I tried to make a 1 kHz test track on a CD by directly synthesizing a sine wave, sample by sample. Rather than using the correct algorithm and advancing the phase of the signal at each clock, which would have been a bit more work, I generated a sine wave that approximated this, with a very slight phase jump (sorry, don’t remember how big it was, but it seemed like it couldn’t possibly be heard) at the 1 second point, where it just repeated from there on. On listening to this, there was a “click” once every second, that nobody who could hear the tone at all would fail to notice. So then I tried again, this time using a precise phase increment at each sample, but this of course still had to round to the nearest count for each sample. The click disappeared, but the track was clearly more distorted than the previous try. Not something you’d notice if I just played you the “correct” track, but very clear if you listened to the one test track immediately after the other. In the end, I used a sine table that exactly matched the sine wave end-to-end, and allowed it to run very slightly shorter than a full second, so that there was an exact number of samples per cycle of the sine wave. This time, the clicks were gone, and the distortion was gone, but the frequency wasn’t exactly 1.000 kHz. Since the precise frequency wasn’t really a requirement, I used this to make the final CD. Audio isn’t as simple as it seems. You can NEVER say “it’s only 62.5 nanoseconds – nobody can hear that”. Until it’s been tested on ears, you just don’t know. Do you know if the IC output has a 50% duty cycle for odd divisors. This would need the output to change on both a rising and a falling clock. The program can’t do that so the duty cycle (like Ag Primatic’s solution) is close to but not exactly 50% for odd divisors. Also a program can’t transition all pins in one clock cycle, they are (as you can see from the code) separated by 3 clock cycles. This could be shortened to 1 clock by loading up two registers then OUTing them on successive instructions. To get another register needs an extra 4 cycles per interrupt and I’m not sure there’s that much leeway. I have verified the basic premise – can generate all signals at 2MHz using a 16MHz board (costing less than $3 – cheering). Although I don’t use 3 cycle instructions, I see up to 2 clock cycles delay going into the interrupt routine. I don’t think that has a significant effect, like the odd division notes it just changes the duty cycle. The code is written for speed above all else – huge amount of duplication to eliminate branching where possible. Each note has its own code, no routines are shared. The SRAM memory is used only as the buffer between the note generator and the interrupt routine, everything else is held in the 32 registers and two of the three GPIORx registers (they are accessible in 1 clock v. 2 clocks for SRAM). Batshit crazy but it works. All tested in the simulator, have some feelers out to get tested in the actual processor. I can load the program, but have no testing equipment. Notes are generated as if from a 2MHz clock (which is double the rate of Ag Primatic’s solution), currently using the divisions used in the original IC. Because the program calculates in 16MHz clock cycles and outputs at 2MHz clock cycles the actual divisions are the IC divisions * 4. (e.g. the divider for E is 1516 = 379 * 4.). This opens the opportunity to adjust some of the dividers to reduce note errors (D=1703,D#=1607,E = 1517, F#=1351). This is contrary to the spirit of emulating the IC but it depends on what the user wants. I have not attempted jitter reduction on the basis that I am assuming the original IC odd dividers already have a +- 250nS variation and nobody seems to worry about that. A very interesting challenge and I think I know enough about the pro mini to hack it for what I really wanted it for. Your assumption about jitter in the original chip is probably not valid, since this was a custom chip that used separate dividers for each note. As such, the jitter would be much less than the clock period. You may be confusing jitter with duty cycle. Duty cycle is the ratio of the signal high time to its overall period, which for a fixed divisor would be exactly the same for every cycle of the signal, while jitter is a cycle-to-cycle difference in the timing, which is effectively a phase modulation of the (ideal) signal. Also, using a different reference clock frequency may deviate from the specific implementation of the original IC, but certainly not the spirit. The spirit was, a black box that has independent outputs for each of the 12 notes of the scale. If you say the +- 250nS is just a deviation from a 50% duty cycle, then the jitter of my circuit without jitter correction would be +-63nS which is the variation in response to an interrupt. 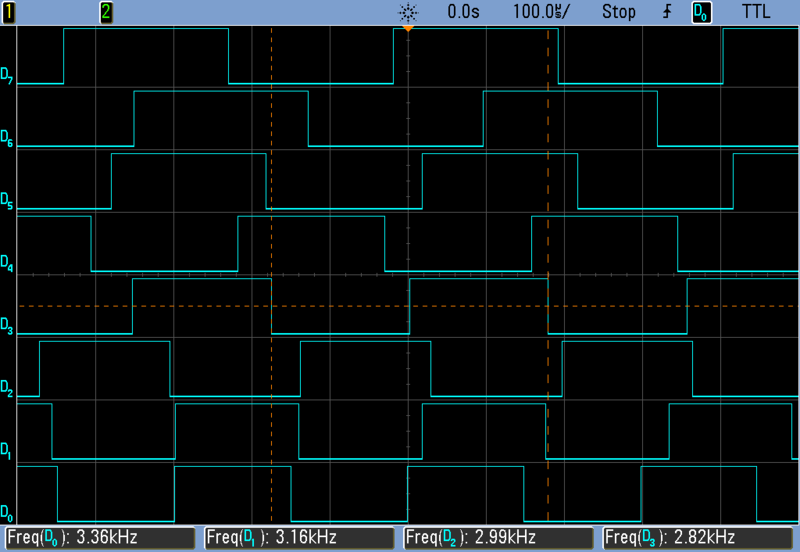 Which I don’t think is a problem in an 8KHz square wave. I figured it could be removed using an extra 6 clock cycles per interrupt and I think I have that to spare. But I believe nobody could detect it. All the outputs change in unison so there won’t be unwanted interaction between signals. I am quite willing to pass the program on to anyone that wants to try it. Just need Atmel Studio, which is free, to load it. Regarding the ‘spirit’, I read somewhere that people actually sought out the sound of the old organs because they wanted the slightly off key sound. Immaterial to me, just saying if more accurate pitch is what someone wants, it can be done. Well I found the extra 6 clock cycles for the delay. It works just fine, it will adjust for 1 or 2 cycle extra latency (reducing the delay to 5 or 4 cycles as needed). So no jitter. Apart from the delay between port output (63nS – there’s no way around this as it needs two instructions) I figure this is equivalent to the IC. The program is loaded into a processor, just have to find someone to verify it is working. Source code: http://www.cashin.net/main.asm – there’s no links to it, just put this in the browser to fetch. Still waiting for someone with test equipment to verify the frequencies. Please. I can post the hex if that’s easier. Thoughts – the program uses the original divisions as used in the IC it emulates. Notes with odd divisors do not have a 50/50 duty cycle. But those notes are unlikely to be used as fundamentals, the notes people play come after division by multiples of two. E.g. A 440 is the IC output divided by 16. Even after division by 2 the duty cycle is 50/50. Because the code runs at 16MHz, it is possible to choose divisors for some notes that produce a pitch closer to the ideal. Some will appear to have +-250nS jitter coming out of the processor, and also after the first division. But note/4 will not have jitter, just not a 50/50 duty cycle and note/8 will be OK and have a 50/50 duty cycle. I think it would sound better. The other thought is that the divisors are currently hard coded (which saves 2 clock cycles). I estimate there are about 7 spare clock cycles per note on average, so it would be easy to put the note divisors in RAM. This opens the possibility of storing many sets of divisors, choosing one at reset. So not only a well tempered scale but a chromatic scale for every key. I also think it may be feasible to change this on the fly. And if that is possible, maybe effects like tremolo or note bending as well. Is that worth pursuing? Closing note: finally had someone verify the program is as close an emulation of an MK50242 running with a 2MHz clock as can be achieved in software. The only difference is 1 clock difference (65nS) between output of top 8 notes and bottom 4 (or 5) notes. The latest (unverified) version emulates the MK50240 (13 notes). Note periods are stored in program memory and transferred to RAM while running, it is possible to have hundreds of 12-note scales and they can be changed on the fly. The basic routine to do the changing is implemented but I haven’t provided a mechanism to drive it (like poll a few input lines to determine which scale to load). I have removed the source code from the website as it is old. It is possible there will be an article in Silicon Chip magazine, they have shown some interest.